ANSI – Also known as the American National Standards Institute, ANSI oversees the development of voluntary national standards for products, services, processes and systems in the US. ANSI also coordinates US standards with International standards so US products meet requirements around the world. Antimicrobial – This is a treatment applied to the liners of certain products that naturally eliminates any bacteria from sweat. ASTM – ASTM International is an organization that develops voluntary standards to be used for materials, products, systems and services across the world. These standards are voluntary because ASTM does not mandate their use. However, they can be given the force of law by the government when they are cited in laws, regulations and codes. Bound Seams – THis iso ur method of reinforcing stitching and seams to increase durability and garment life. Bound seams are used primarily on our Iron-Tuff™ garments. CE – The CE Mark means that the product with this marking is in compliance with EU legislation and it can be sold in the European Market. Comfort Rating – A comfort rating is a temperature or temperature range in which a particular piece of insulated clothing, boot or glove would protect you. Comfort ratings on insulated clothes range from -60°F to 20°F, footwear ranges from -100°F to 15°F and gloves range from -30°F to 10°F. See our Comfort Rating Guide for more information. Composite Safety Toe – These safety toes are made of composite materials and are usually a combination of plastic, Kevlar aramid fiber and carbon fiber. They are lighter than steel toes in weight but protect just as well. CSA – The Canadian Standards Association develops standards in the US and Canada to be used for materials, products systems and services. CSA works to make sure CSA standards meet global standards as well. Ergo/Ergonomic Glove – This implies that the glove is pre-curved to fit and form to your hand’s natural shape, decreasing fatigue. Goodyear Welt Construction – This type of boot construction is when the outsole of a boot is sewn rather than glued to the upper section. Heel Reinforcement Patch – This is a heavy-duty patch on the inside of the leg cuffs of certain garments. The cuff protects your garment from tears when pulling bibs over boots, and from abrasion when cuffs drag on floors. The patch is sewn on the inside bottom of the leg. HiVis – This term refers to garments, gloves and headwear that are available in bright colors such as lime and orange, and are designed to improve visibility to meet safety standards. All of our HiVis garments meet ANSI Class 2, 3 or E Standards. View our HiVis Garments. InduraDex™ – Induradex™ classifications indicate insulation, durability and dexterity ratings for gloves. The scale is from 1-10, with higher numbers meaning better ratings. 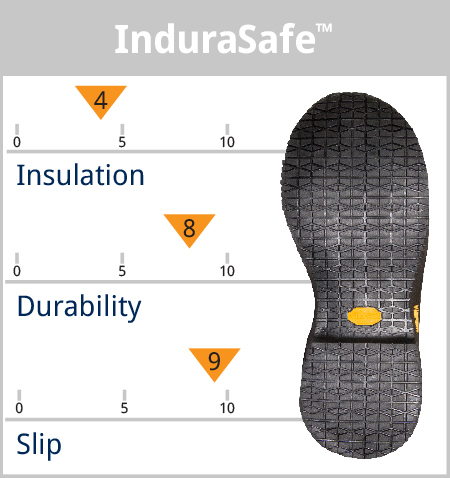 InduraSafe™ – InduraSafe™ classifications indicate insulation, durability and slip resistance ratings for footwear. The scale is from 1-10, with higher numbers meaning better ratings. Moisture Wicking – This is a type of fabric designed to pull moisture away from the skin. This material draws moisture, such as sweat, off of skin and out to the exterior of the fabric. Moisture can then easily evaporate from the surface of the fabric, rather than when is it trapped between the garment and the skin. Pac boots – These are boots that are designed to be worn with a liner/inner shoe in extreme conditions. Pac boots are typically the warmest boots you can find. Raglan Sleeves – These are sleeves that start at the neck (rather than the shoulder) with a diagonal stitch that extends to the armpit. Reflective Lining – Combined with insulation to keep you warm, reflective lining trasp the heat that is created inside the jacket and provides more warmth. RefrigiFill – This is our proprietary blend of insulation that is used in our Iron-Tuff™ and HiVis™ Iron-Tuff™ line of insulated garments. It has been perfected over 60 years of insulating garments and hundreds of thousands of satisfied users. RefrigiFleece – This is RefrigiWear’s spin on fleece, a tougher and more durable fleece to keep you warm. You can feel the difference in density and warmth. Rubber Toe Guard – This is a rubber, protective section over the toe of boots that protects from scuffs and damage, leading to more toe durability. Softshell – This term describes our line of water-resistant garments that have a comfort stretch microfiber shell, breathable polyurethane membrane and micro-fleece inner-shell. These Softshell garments have a softer, less bulky, form-fitting structure and are available in men’s and women’s options.